Apple on Wednesday announced it will on Aug. 1 reveal quarterly earnings for the third fiscal quarter of 2017, traditionally the slowest sales period of the year for the tech giant. Announced through Apple's Investor Relations webpage, the upcoming earnings report is to be followed by a live-streamed conference call Tuesday, Aug. 1, at 2 p.m. Pacific, 5 p.m. Eastern. As usual, Apple CEO Tim Cook and CFO Luca Maestri are expected to provide commentary on the performance metrics and field questions from investment analysts. For the third quarter, Apple is looking to return iPhone to year-over-year growth after a string of quarterly dips. The lucrative holiday shopping season saw iPhone sales return to growth at the end of 2016, but the progress was short lived as sales slumped in the second quarter of 2017. Bolstering Apple revenue during iPhone's recent sales fluctuations was services. The sector, which for Apple includes Apple Music, iCloud, iTunes and App Stores, has steadily grown over the past year and was up 18 percent during the second fiscal quarter of 2017. Apple is guiding for revenue between $43.5 billion and $45.5 billion with a gross margin between 37.5 percent and 38.5 percent for the third fiscal quarter of 2017. Operating expenses are expected to come in between $6.6 billion and $6.7 billion. If Apple manages to reach those estimates, it will outperform on a year-over-year basis. 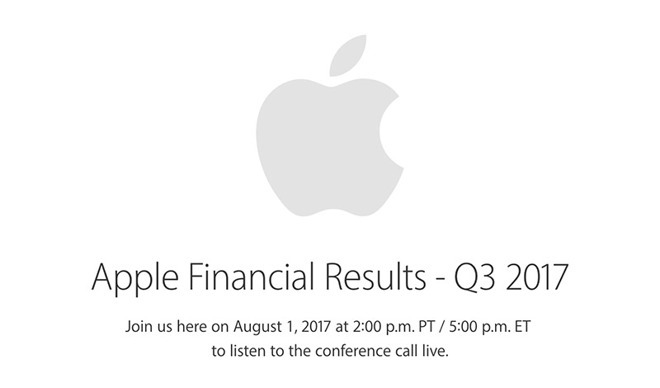 AppleInsider will provide live coverage of Apple's conference call for the third quarter on Tuesday, Aug. 1, starting at 2 p.m. Pacific, 5 p.m. Eastern.